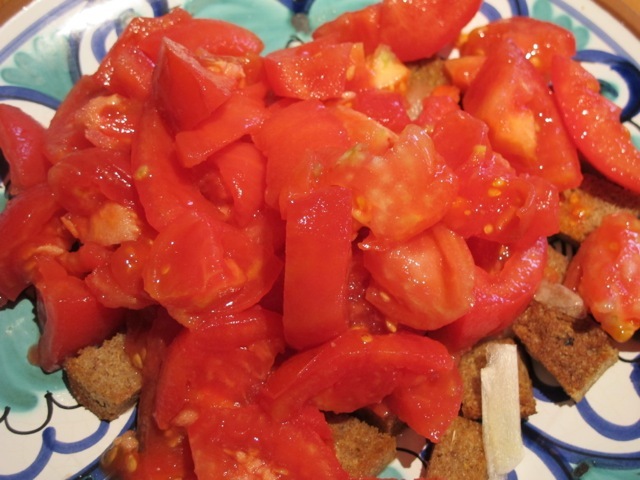 Back then I made it with roughly torn pieces of stale white ciabbata bread and sun-sweet tomatoes bursting with juice, assembled an hour or so before eating, dressed and turned over to let the juices do their work melding the oil and garlic and softening the bread. It then sat, covered, ready for a proud presentation–convenient, as well as delicious. But when white bread got the boot I was put off making it. 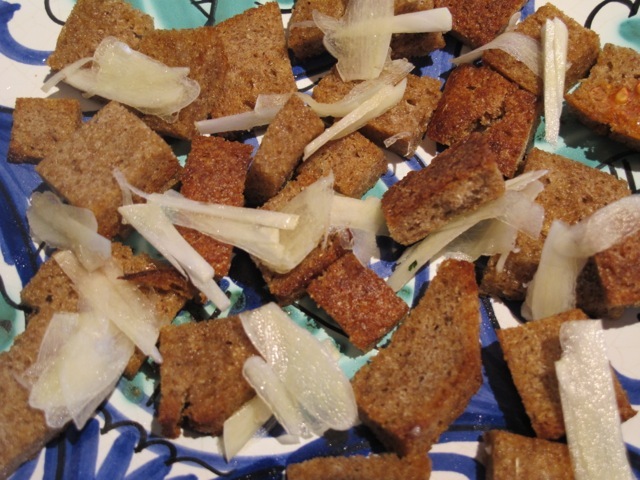 This week I remembered a version I’d had at La Famiglia (favourite Italian restaurant in London) years ago, made with neatly cut smaller pieces of bread that had been fried in olive oil. At the time I was disdainful of its inauthenticity (pompous thought!). Reminded of how much I missed it, I tried it with a few neat pieces of the 100% organic rye bread I have for breakfast, dribbled with olive oil and browned in the oven for a few minutes. It got the nod at lunch! Though Meredith insists this is not worth doing with less than ripe tomatoes–je suis d”accord. It’s a late summer salad–handy if you have a tomato glut. Toss the bread pieces in a tablespoon of olive oil and spread them on a small oven tray and put it in oven as it heats up. Check after ten minutes to see if the pieces have browned a little. If so, take them out and let them rest or if not, cook on a few moments more. 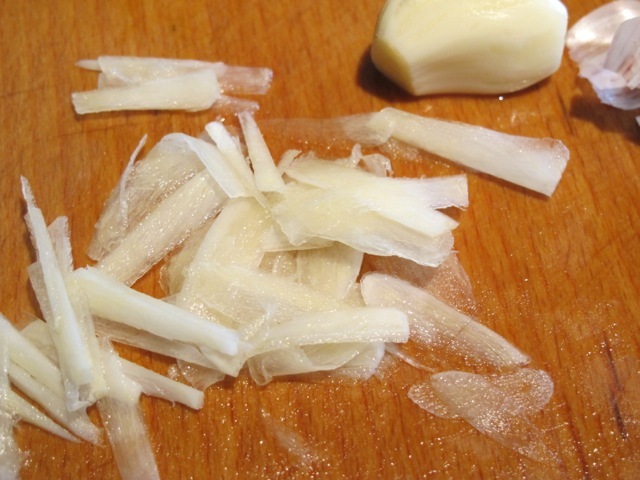 Slice the peeled garlic clove as thin as you can. Then add them to the bread. Pile on the tomatoes and their precious juice. 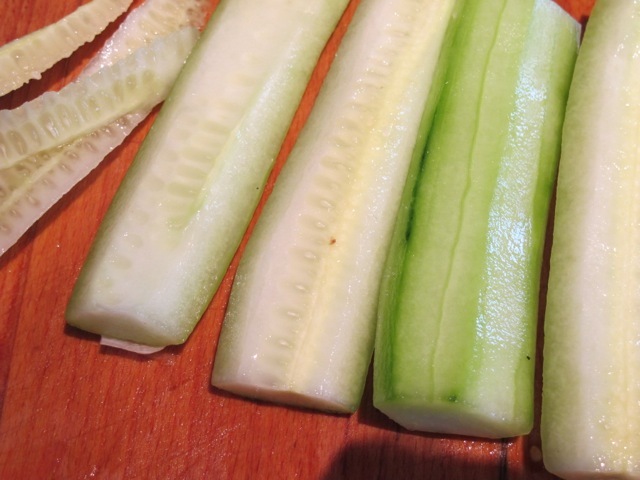 Whisk together the oil, vinegar, salt and pepper and pour the dressing over the salad. Having dutifully “followed my own instructions” I realised the plate I’d been assembling the salad on, though it looked good, was too small on which to turn the salad over comfortably! Finished by sprinkling over with chopped parsley. Oh, we love this. 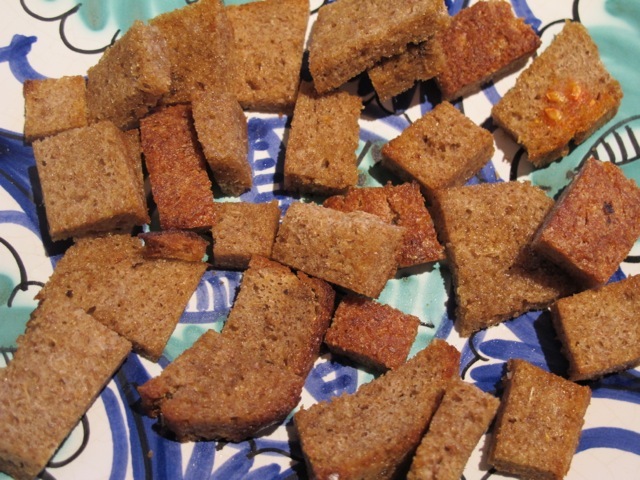 I make whole-wheat sourdough bread, and it makes the most delicious croutons. 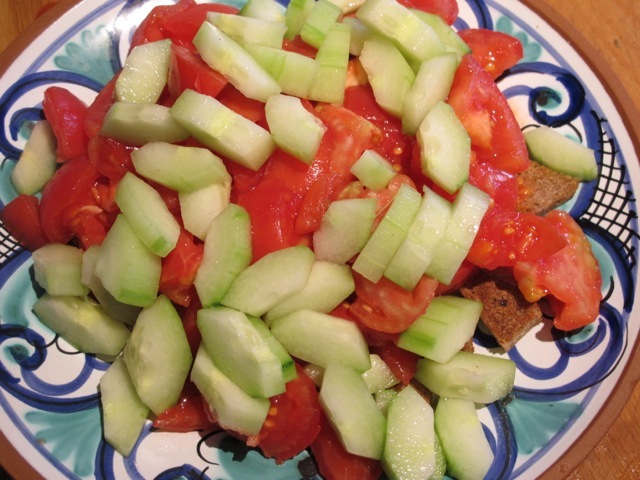 The leftovers–if there are any–are terrific for lunch the next day: sort of a pickled salad. I have even eaten it for breakfast! This looks absolutely yummy and am going to try it later. But wanted to mention La Famiglia restaurant. Back in the day it was owned by a good friend of the family – Corrado Boiardi. He still is a good friend but has not been the owner for years. Just wondered if he was there when you used La Famiglia. If so, I’ll mention you when I see him next (soon). Alvaro Maccioni owned it when I was going–70’s, 80’s–and I think still does. World’s End Chelsea. I never met Corrado to my knowledge. Alvaro and family(famiglia) used to watch Poldark on his night off–Sunday! That Alvaro was no fool! 🙂 The restaurant was a fave of many celebrities. I’ll be seeing Corrado soon so will mention you. btw am hoping to refresh our article and get some more exposure for the new book. Fingers crossed. Robin this sounds delicious,but for the cucumber,could I use celery instead,Cucumber and I came to an agreement a long long time ago if I did not eat it,it would not give me the gripes. Elaine–you can use whatever suits you! This looks like a perfect salad for today! Was hoping to find something to use up my last tomatoes of the season, and my last cucumber! Hello Robin! 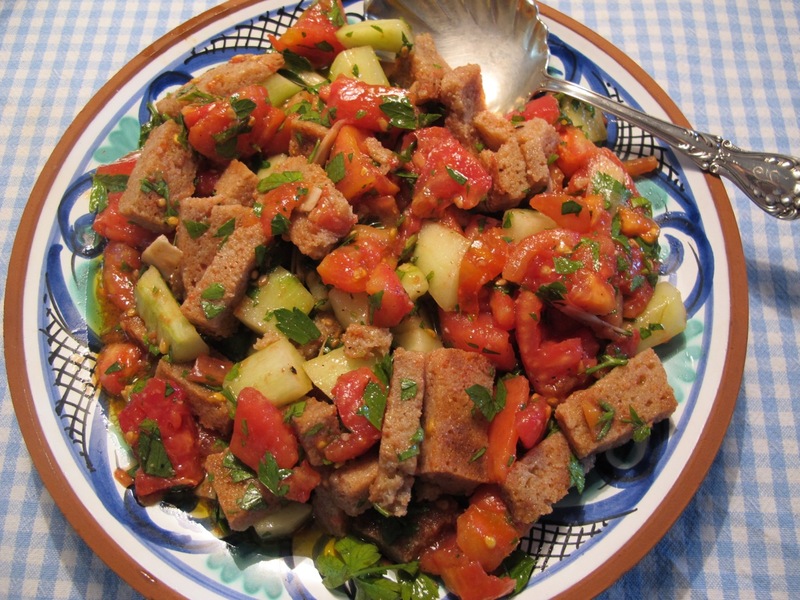 Cooked (and eat)Panzanella just last Friday, ah,ah! Here its very warm yet so it was a perfect food for dinner! Thank you and I wish a nice week! Hello Bea–sounds lovely and authentic!! This sounds great. I will certainly try this one with one exception. My lazy self will use already made croutons. That looks Beautiful Robin! Infact i shall have a go at making it this weekend! I think we have an abundance of tomatoes in UK too ! I got 5 fairly large, on the vine toms yesterday for 69p…Stunning photos! cheers maurice in glasgow.